My Blu-ray budget is about to expand significantly as we inch closer towards the holiday season, and the Steven Spielberg trifecta kicks off this month with the Jaws Blu-ray, followed by E.T The Extra-Terrestrial and Indiana Jones: The Complete Collection in the ensuing weeks. A full list of the special features included on the four-film Indiana Jones Blu-ray set has now been released, and it appears that only one new documentary will be on the set. Nevertheless, the two-part “On Set with Raiders of the Lost Ark” boasts nearly an hour of rarely seen footage from the set and archival interviews, and the collection also includes a 1981 making-of documentary for Raiders that was previously unavailable on DVD as well as all the bonus features that appeared on earlier home video releases of all four Indiana Jones films. Hit the jump to check out the entire list of what the set entails, including specifications. 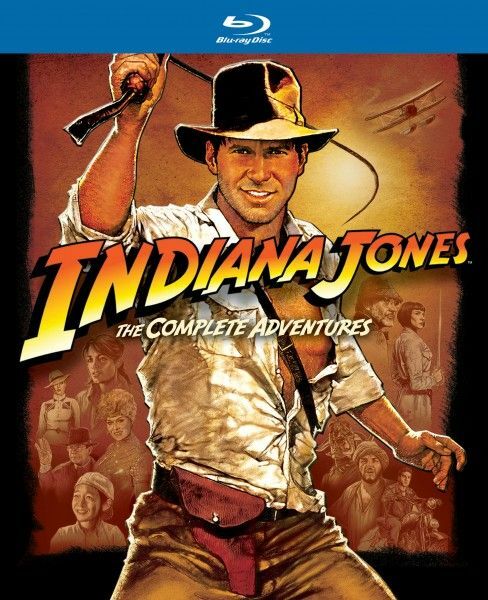 Indiana Jones: The Complete Collection hits stores on September 18th. SAN FRANCISCO, Calif. (August 7, 2012) – Every unforgettable exploit of world-renowned, globetrotting hero Indiana Jones finally comes home with pristine picture and sound when INDIANA JONES: The Complete Adventures debuts on Blu-ray September 18, 2012 from Lucasfilm Ltd. and Paramount Home Media Distribution. The cinematic classic that started it all—Raiders of the Lost Ark—has been meticulously restored under the supervision of director Steven Spielberg and sound designer Ben Burtt. Additionally, Indiana Jones and the Temple of Doom and Indiana Jones and the Last Crusade have both been remastered alongside 2008’s Indiana Jones and the Kingdom of the Crystal Skull making this landmark release the first time all four films in the epic and award-winning franchise have been available together in sparkling high definition. INDIANA JONES: The Complete Adventures will also be available on iTunes, so the adventure is just a click away! In addition to all of Indy’s thrilling adventures, the set includes seven hours of fascinating documentaries, featurettes and interviews with cast members and filmmakers. This comprehensive collection of behind-the-scenes bonus features is augmented by a brand new two-part documentary entitled “On Set with Raiders of the Lost Ark – From Jungle to Desert and From Adventure to Legend.” Featuring nearly an hour of rarely seen footage from the set of the film and archival interviews with Steven Spielberg, George Lucas and Harrison Ford, these captivating pieces transports fans back to where the legend began. Raiders of the Lost Ark has been painstakingly restored with careful attention to preserving the original look, sound and feel of the iconic film. The original negative was scanned at 4K and then examined frame-by-frame so that any damage could be repaired. The sound design was similarly preserved using Burtt’s original master mix, which had been archived and unused since 1981. New stereo surrounds were created using the original music tracks and original effects recorded in stereo but used previously only in mono. In addition, the sub bass was redone entirely up to modern specifications and care was taken to improve dialogue and correct small technical flaws to create the most complete and highest quality version of the sound possible while retaining the director’s vision.